He is a good sport. 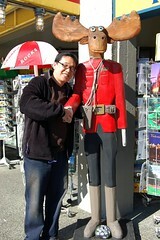 Very friendly to creatures great and small. I like how he's doing the signature Jennifer Aniston pose in the top right pic! This immediately put a smile on my face this morning :) Thank you, Mr. Monkey. we were just talking about what a saint mr. monkey is this weekend. i think we concocted some horribly difficult scenario and then were like WWPD. It's like Mr. Monkey at the Canadian zoo. 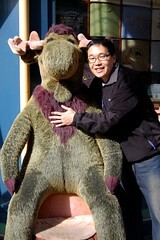 canadians are freakishly-obsessed with the moose. My comments haven't been working. 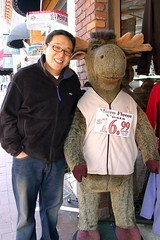 I'd like to request an autograph from the Northern Exposure moose next time. Thanks. Nice job, Mr. Monkey. I love all the creatures, great and small! What a good sport. he is a good sport. 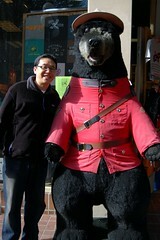 bear won't let me post a photo of him and a large bear i took. boo!